Trim all fat off the meat. Cut steak in to 4 inch strips. The steak should be about 1/2 inch thick. It's easier to cut meat partially frozen. Pound meat lightly, you don't want it too thin. Cover and refrigerate overnight (8 hrs). Line cookie sheets with tin foil. Place steak strips on sheets, don't overlap meat. Set oven at lowest temperature. (150-175°F). Bake six hours, turning after three hours. Jerky is done when meat is dried out, depending on your oven. Preheat the oven to 375 degrees. Thoroughly butter a large casserole dish. Heat a medium non-stick pan over medium high heat, and cook the bacon until crispy, set aside on a paper towel to cool and drain. Once it's cooled, chop it up into bits. Heat a large non-stick pan over medium high heat, add about 1/4 cup of olive oil. Add the potatoes and sauté them until they start to turn golden brown. Season them with a pinch of salt. Transfer the potatoes to the buttered casserole dish, creating a layer of golden potatoes on the bottom of dish. Allow them to cool while you combine the beaten eggs, milk, garlic, salt, and pepper, bacon, and sour cream in a large bowl. Once the potatoes are mostly cooled, pour the egg mixture over them. Sprinkle the top of the eggs mixture with the parmesan and parsley. 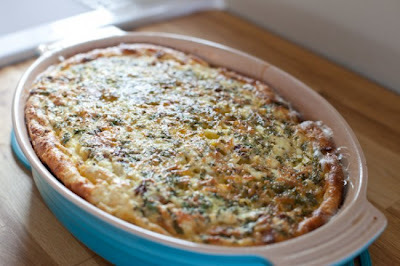 Use a fork to gently combine the parsley and parmesan with the egg mixture. Don't mix it in too much, just enough that it's not sitting on top of the dish. Then, put the dish in the oven on the middle rack and bake until the sides are golden brown and the center is set, about 45-60 minutes. You can check to see if it's done by jiggling the dish a bit. If the eggs in the middle are still runny let it cook for another 10 minutes until the eggs set up. Remove from the oven and allow it to rest for about 10 minutes before serving it.